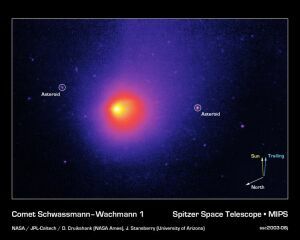 On September 23, 2010, astronomers released new computer simulation images of what the Solar System may look like from interstellar distances in infrared light that is sensitive to the presence of cold dust. Derived from supercomputer simulations that track the interactions of 75,000 icy dust grains, the images show that our Sun, Sol, is surrounded by an enormous disk of cold dust that is visible in infrared wavelengths. Seen as a dense bright ring when the Sun was young and its planets still developing, the appearance of the "debris disk" would dim and broaden as the planetary system developed and much of the dust fell inwards into the Sun or was pushed outwards into interstellar space. Although the planets may have been too dim to detect directly, aliens studying the Solar System could have easily determined the presence of Neptune because its gravity carves a small dark gap in the dust (NASA press release with more images and video; GSFC "Geeked on Goddard" blog post; and Kuchner and Stark, 2010 -- more on Sol's dust disk below). as the planets developed (more). During the 1980s, a belt of Edgeworth-Kuiper "proto-comets" was proposed by Julio A. Fernandez (1980) and by M. Duncan, T. Quinn, and S. Tremaine as the origin of short-period comets. These comets orbit the Sun in the same direction as the planets, only slightly inclined from the plane of the ecliptic (near which all of the planets orbit). Since short-period comets could not have originated from the more distant spherical Oort Cloud as originally believed, they come from a second, more flattened reservoir of "dormant" comets beyond the orbit of Neptune. A real-time Plot of the Outer Solar System is available from the Minor Planet Center. Although the first Edgeworth-Kuiper object (EKO) was not discovered until 1992, a multitude has been discovered since -- over 1,100 by September 2006. 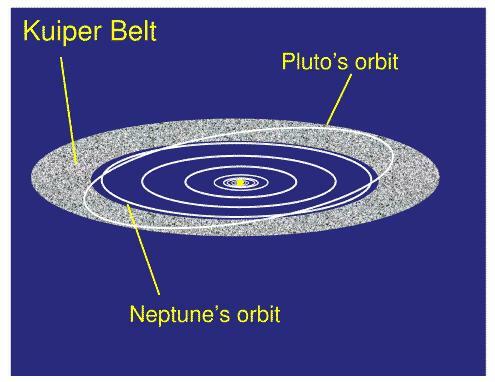 As predicted by planetary theorists (e.g., Duncan et al, 1994; and Levison and Duncan, 1993), the vast majority (over 90 percent) of these objects travel in highly circular orbits beyond Neptune where they appeared to have formed (also called Trans-Neptunian Objects or TNOs -- more definitions at the Kuiper Belt Page). 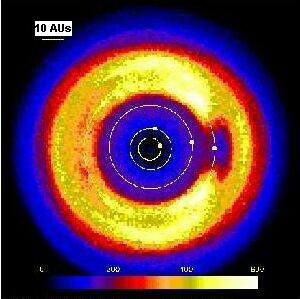 A subpopulation of over two dozen EKOs that may have formed closer to the Sun but subsequently were scattered by Uranus and Neptune (called "Centaurs and scattered disk objects") have also been discovered in highly inclined, elliptical orbits extending as far out as 200 AU, forming a "fat" scattered disk that is some 10 AUs high. These "dynamically hot" EKOs tend to be redder in coloration as well (S. Alan Stern, Astronomy, April 2010: pp. 30-35). the Sun, but some orbit much farther. 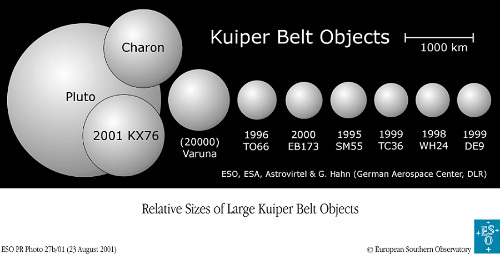 The outer edge of the Edgeworth-Kuiper (E-K) Belt is currently uncertain, however. Until the announced discovery of 2004 XR 190 in December 2005, no large EKOs beyond 50 AUs had been found as yet in circular orbits that were unperturbed by the giant planets (Neptune, Uranus, Saturn, and Jupiter). It is possible that the outer E-K Belt has been "dynamically cold" since their formation, undisturbed by Neptune's formation and hypothesized early migration outwards by as much as eight AUs. One hypothesis is that these outer EKOs may be relatively smaller (less than or equal to 400 km or 250 miles in diameter) and inhabit a thin plane that is inclined by at least 0.5� from the plane of the ecliptic. Thus far, these distant EKOs have escaped detection by deep ecliptic surveys, leaving astronomers to consider whether the outer E-K Belt was perturbed by something else other than the giant planets or that the primordial Solar nebula was smaller than currently hypothesized (Joseph M. Hahn, 2000; and explanation of Lynne Allen's summary of research links on the Kuiper Belt). Pluto and Charon are suspected as being among the larger examples of these icy worlds of the outer Solar System, where there may be as many as 100,000 EKOs with diameters greater than 100 km (62 miles) -- as well as a billion or more kilometer-sized comets -- orbiting within 50 AUs of the Sun. In general, however, EKOs are generally very small at 10 to 50 km (six to 31 miles) across and not very bright. They take hundreds of years to complete an orbit around the sun, which makes their detection difficult. On August 9, 2006, astronomers announced that their use of archived observations from NASA's Rossi X-ray Timing Explorer to detect 58 dips in X-ray radiation from the background neutron star, Scorpius X-1, and its eclipsing stellar companion (which are caused by the occultations of nearer, small extremely dim objects) leads them to estimate that the number of even smaller EKO's of around 100 meters (330 feet) in size may number around a quadrillion (more from the Observatoire de Paris-Meudon and New Scientist). 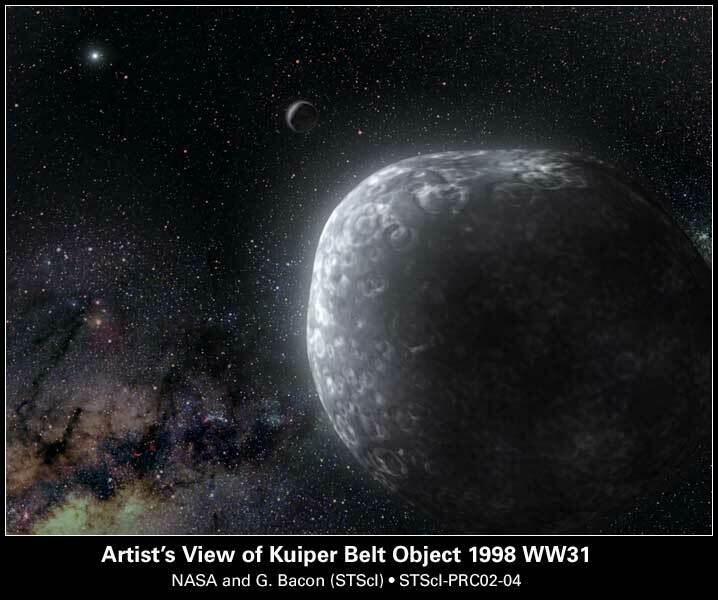 On July 29, 2005, a team of astronomers (including Mike Brown, Chad Trujillo, and David Rabinowitz) announced the discovery of a planetary body (Eris or 2003 UB313) that is now estimated to be around three percent larger than Pluto (NASA press release; latest news; and Brown et al, 2005, in pdf). 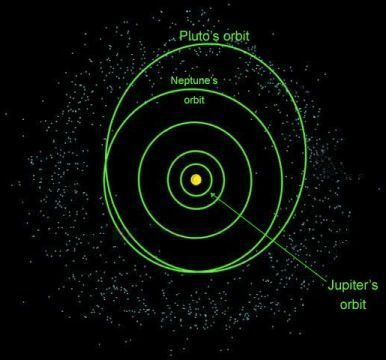 As a result, there is renewed debate among the astronomical community over the definition of planet and how large planetary bodies roughtly close to the size of Pluto that are being found in the outer Solar System beyond Neptune's orbit should be classified. Most EKOs orbit the Sun in a disk-shaped region lying mostly within the plane of the planets beyond the orbit of Neptune, or more than 30 AUs outwards from the Sun. 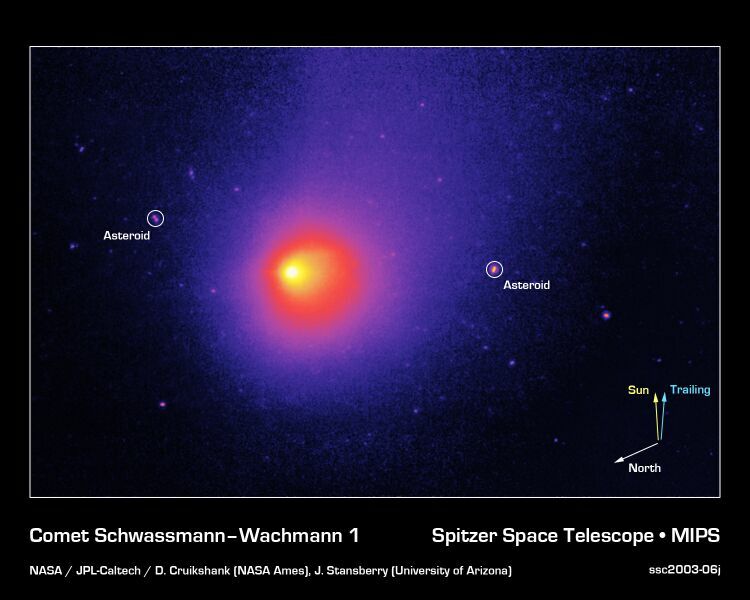 Unlike active comets, these icy planetary bodies are thought to be primordial planetesimals that were left relatively untouched (other than from mutual collisions) in the plane of the dust disk from which all planets formed during the first 100 million years or so of the Solar System's birth. Unlike the rocky asteroids, EKOs and comets lie so far out from the Sun that they still contain a lot of water and gas ices (like methane) on their surface. 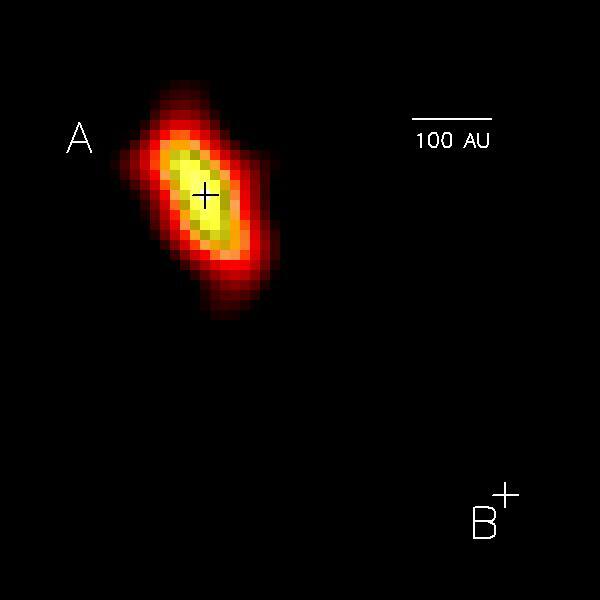 The EKOs discovered during the 1990s, such as 1992 QB1 and 1993 SC, appear to be icy planetary bodies similar to Pluto and Triton, if smaller. 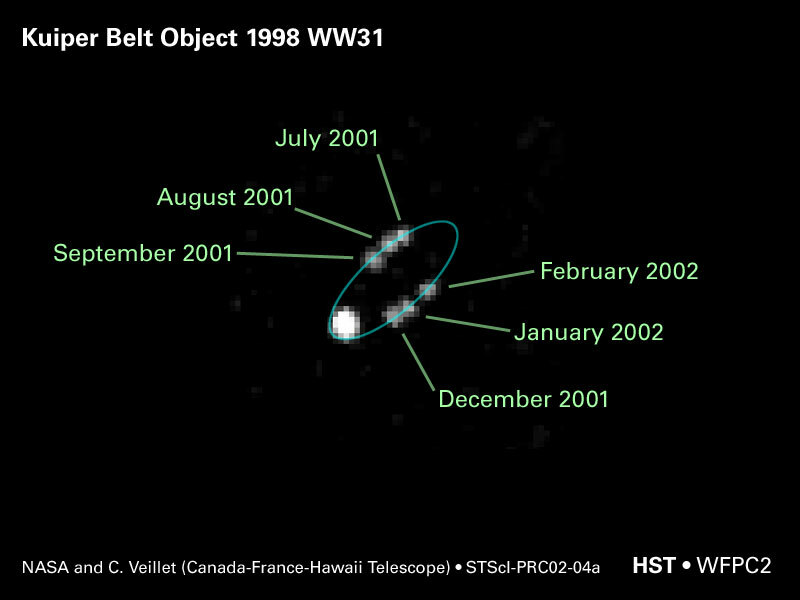 Since 1992, over 300 of these "Plutinos" ("trans-Neptunian" objects orbiting in 3:2 resonance with Neptune like Pluto) have been identified. Color measurements of some of the brightest of these objects indicate that they are unusually red. Even if there were only somewhat more than 35,000 EKOs greater than 100 km (62 miles) in diameter, their total mass would total several hundred times that of similar sized objects in the main asteroid belt, given the much larger volume of space in the belt. Moreover, astronomers using the Hubble Space Telescope have detected much fainter EKOs that are much smaller, measuring perhaps only 20 km (12 miles) or so across. There may be as many as 100 million of these smaller objects in low-inclination orbits. 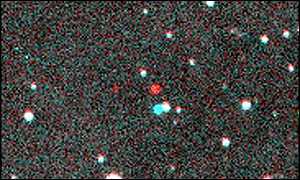 A very large EKO was discovered on March 15, 2000, between the orbits of Neptune and Pluto. and next in size to Ceres, the largest asteroid. 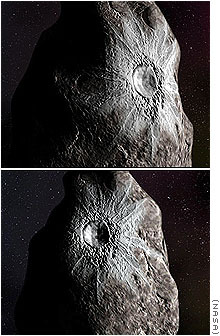 It is classified as a "Plutino" ("trans-Neptunian"
release of October 25, 2000). 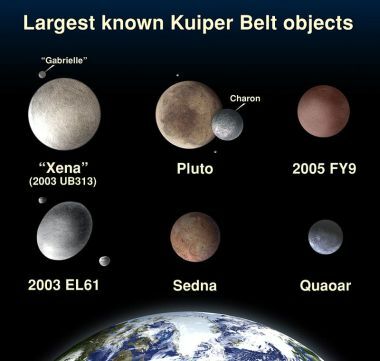 On the other hand, the Edgeworth-Kuiper Belt was once immensely more massive than it is today, perhaps some 10 to 50 Earth-masses (S. Alan Stern, Astronomy, April 2010: pp. 30-35). 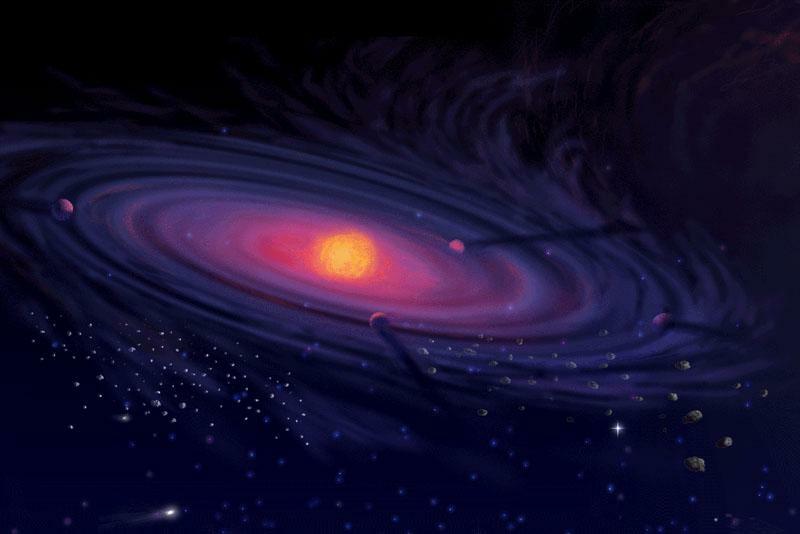 Computer simulations suggest that virtually all (99 percent) of the mass in the original disk as far out as 70 AUs, was lost as the development of Neptune fostered collisions that grounded many EKOs into fine dust, which was eventually blown out into interstellar space by the Solar wind over the eons (S. Alan Stern, Astronomy, September 2000). 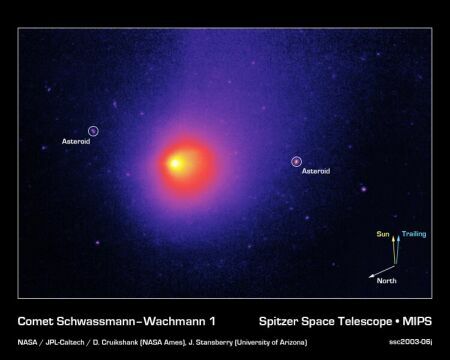 Beyond 70 AUs, however, massive remnants of that primordial Belt that are possibly larger than Pluto may yet lurk undetected today. its nature was unrecognized at the time. The orbit of a EKO can become so disturbed by the gravitational attraction of the giant planets that it moves to cross the orbit of Neptune. If the object has a close encounter with Neptune or Uranus, then the planet's gravitational force can sling it into the Oort Cloud and perhaps onward into interstellar space, into the inner Solar System as a comet, or into an unstable orbit crossing those of the other giant planets. a common center of gravity every 570 days (more from STScI and CFHT). 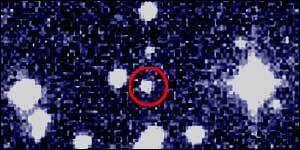 The Edgeworth-Kuiper Belt is the source of the short-period comets. For example, there are at least nine known objects orbiting between Jupiter and Neptune, including 2060 Chiron (aka 95 P/Chiron) and 5145 Pholus, that have been designated as "Centaurs," whose orbits are not stable. Some of these objects show cometary activity as fuzziness in their image, indicating the presence of a diffuse coma. The largest known Centaur is Chiron which is about 170 km (106 miles) in diameter or 20 times larger than Halley's Comet. If Chiron is ever is perturbed into an orbit that approaches the Sun, it will be become a truly spectacular comet. 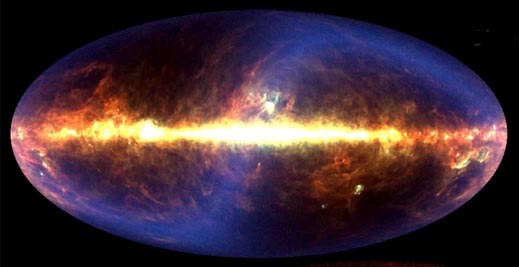 Larger and jumbo infrared images. 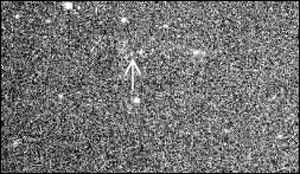 By January 2006, of the one thousand some EKOs discovered, only a few were found to be currently orbiting farther from the Sun than 55 AUs, despite recent surveys that were capable of detecting objects out to 65 AUs out. Lynne Allen and Gary Bernstein of the University of Michigan and Renu Malhotra, of the University of Arizona and the Lunar Planetary Laboratory suggest that some event may have stripped away most of the planet-building material beyond 50 AUs from the Sun (more information). Lists of known EKOs are available for Trans-Neptunian Objects and for Centaurs and Scattered Disk Objects. David C. Hewitt, co-discoverer of the first EKO after Pluto and Charon, has a plot of the projected orbits of the various types of EKOs. Real-time orbit animations of known EKOs (and other comets, asteroids, and planets) may be available from the Orbit Viewer, originally written by Osamu Ajiki of AstroArts and modified by Ron Baalke of NASA's Jet Propulsion Laboratory. On August 24, 2006, the IAU established a new class of substellar objects in the Solar System called "dwarf planets," which encompasses many large and relatively round Edgeworth-Kuiper ice bodies, including Eris (formerly 2003 UB313), Pluto, Haumea, Make-make, and Orcus. On June 11, 2008, the International Astronomical Union (IAU) voted at the meeting of its Executive Committee to establish bright "dwarf planets beyond the orbit of Neptune as a new class of substellar objects in the Solar System called "plutoids" (IAU press release). According to the IAU, these plutoids "are celestial bodies in orbit around the Sun at a distance greater than that of Neptune that have sufficient mass for their self-gravity to overcome rigid body forces so that they assume a hydrostatic equilibrium (near-spherical) shape, and that have not cleared the neighbourhood around their orbit. Satellites of plutoids are not plutoids themselves, even if they are massive enough that their shape is dictated by self-gravity. The two known and named plutoids are Pluto and Eris [formerly 2003 UB313]." In addition, "it was decided that, for naming purposes, any Solar System body having (a) a semimajor axis greater than that of Neptune, and (b) an absolute magnitude brighter than H = +1 will, for the purpose of naming, be considered to be a plutoid," so that many large and relatively round Edgeworth-Kuiper ice bodies may eventually be designated as plutoids. 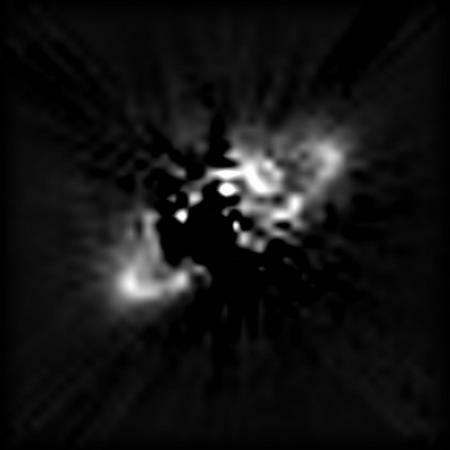 On September 23, 2010, astronomers released new computer simulation images of what the Solar System may look like from interstellar distances in infrared light that is sensitive to the presence of cold dust. Derived from supercomputer simulations that track the interactions of 75,000 icy dust grains, the images show that our Sun, Sol, is surrounded by an enormous disk of cold dust that is visible in infrared wavelengths. Seen as a dense bright ring when the Sun was young and its planets still developing, the appearance of the "debris disk" would dim and broaden as the planetary system developed and much of the dust fell inwards into the Sun or was pushed outwards into interstellar space. Although the planets may have been too dim to detect directly, aliens studying the Solar System could have easily determined the presence of Neptune because its gravity carves a small dark gap in the dust (NASA press release with more images and video; GSFC "Geeked on Goddard" blog post; and Kuchner and Stark, 2010). In February 2002, a team of astronomers (including Markus Landgraf, Eberhard Gr�n, Jer-Chyi Liou, and the late Herb Zook) announced its finding of the first direct evidence that a disk of dust surrounds the Solar System, extending outwards from Sol just beyond the orbit of Saturn and outwards from the E-K Belt (ESA press release). Since the birth of the Solar System, most of the dust of its host nebula was incorporated into the larger planets and minor planets, fell into Sol, or was ejected from the System. The recently detected disk of relatively cool dust, however, is being continually generated and replenished by collisions between the icy bodies of the E-K Belt, as sunlight eventually pushes dust particles smaller than 1 micron into interstellar space while larger particles fall into the Sun through Poynting-Robertson drag within a 100,000 years (David R. Ardila, Scientific American, April 2004). Larger false-color and black and white images. like the disk detected around the star HR 4796 A at left (more). Some astronomers differentiate this large outer dust dusk of the Solar System from the smaller but similarly disk-shaped zodiacal cloud of warmer dust generated by collisions within the Main Asteroid Belt. To sustain the current size of the Solar dust disk at its average density of about one dust particle for every 50 cubic kilometers, about 50 metric (55 short) tons of dust must be generated every second. Many astronomers now believe that the E-K Belt objects of planetary systems around other middle-aged stars like Sol should also be producing dust that replenish their own dust disks. 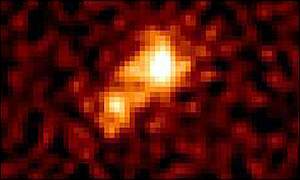 DIRBE Team, COBE, NASA -- larger infrared mage. Jupiter's orbit (more at Astronomy Picture of the Day). When observed from a distance of several light-years, micrometer-to-millimeter-sized interplanetary dust particles generated from collisions of EKOs can be detected in a large circumstellar disk around Sol. 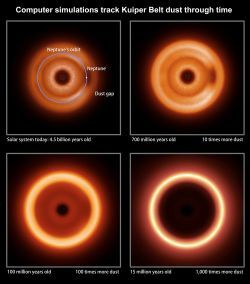 Such disks currently may be the most easily detectable features around stars that indicate the presence of a planetary system. Moreover, numerical simulations of the dust suggest that the presence of the Solar System's four gas giants (Jupiter, Saturn, Uranus, and Neptune) have a dramatic impact on the movement and ultimate distribution of this dust in the Solar System. Once generated, Poynting-Robertson drag cause larger dust particles to spiral slowly into the inner Solar System towards Sol. Gravitational interactions with intervening planets tend to gather concentrations of some infalling dust into mean-motion resonances (MMRs) -- which have been detected in the zodiacal cloud. Eventually, however, much of the larger dust particles are gravitationally ejected out of the Solar System by the inner giant planets, or eventually absorbed by Sol. orbit, and an apparent "hole" within 10 AUs of Sol (more). 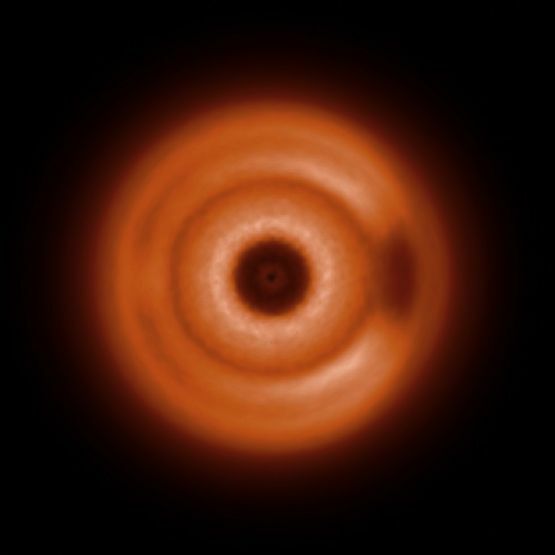 Numerical simulations suggest that infalling dust from the EKO dust disk is gathered into MMRs by Neptune -- observed as brighter "arcs" in the disk -- before moving further inward towards the Sun, where Jupiter and Saturn eventually eject 80 percent of the inward moving dust. Such arcs of higher dust density also have been detected in infrared images of extra-Solar dust disks (e.g., Epsilon Eridani, Fomalhaut, Vega, and Beta Pictoris). It is hypothesized that an extra-Solar observer looking into the Solar System in certain infrared wavelengths would see relatively brighter arcs in the Solar dust disk beyond the orbit of Neptune, a dark spot -- an area of greatly reduced dust density -- in the disk closest to that giant planet which moves with Neptune's orbital motion, and a "hole" (very little detectable dust) in the disk within 10 AUs of Sol (Liou and Zook, 1999).